You know that keeping more dollars in town is the best thing for making your town prosper. The local movement has been a big help, making more people stop and think about ways to spend money locally. But it isn’t enough. You tell people to Buy Local, and then they get bad service in a local business, and there goes all the good work of your campaign. 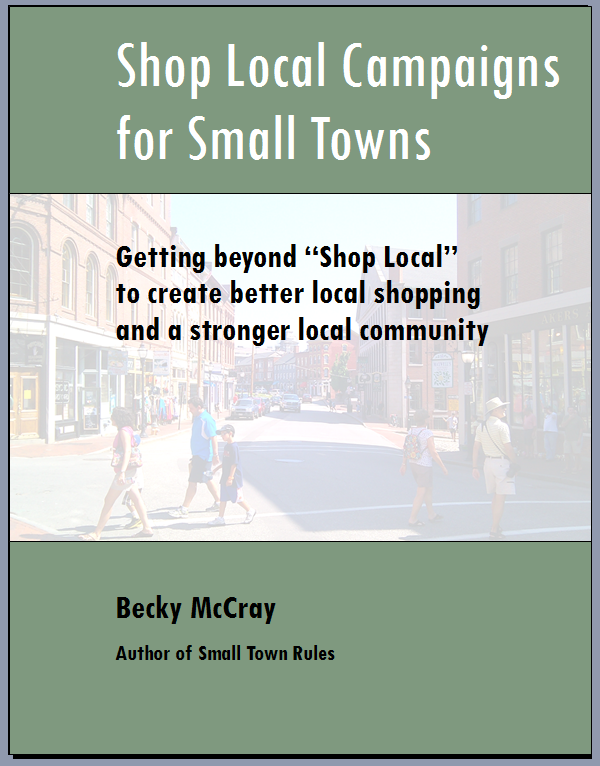 This downloadable eBook walks you through that problem and many more to get your small town shop local project up and running. Too much of the advice I found on Shop Local was written like everyone was in big cities. I know that we do things differently in small towns. You don’t have a million local customers to draw from. You don’t have a steering committee with 25 people. You don’t have a designer on staff to do all the graphics work. You may not have anybody on staff. 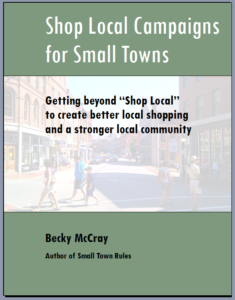 This shop local for small towns downloadable ebook is not a general guide written for big cities. It’s a specific how-to manual for small towns. As much as possible, I give you the exact steps, connect you to the pre-made resources, and walk you through real-world examples. And it doesn’t stop with Shop Local. I actually take on that elephant in the room: your local businesses that desperately need an upgrade. Because I know you’ll have to work on improving your local businesses if your campaign is going to succeed. What qualifies as “small town”? Well, small town can be a set population, like 20,000 people or fewer. Usually, it’s lots fewer, more like under 5,000 or under 1,000 people. Small town can also be a small neighborhood. Maybe you’re in a neighborhood in a big city, or a small town that the big city gobbled up, but you still have your own character and you want to keep it that way. Small town can also be rural or regional towns in Australia, or villages or high streets in the UK, or any other place where you don’t have a lot of people to rely on and you want your community to prosper. 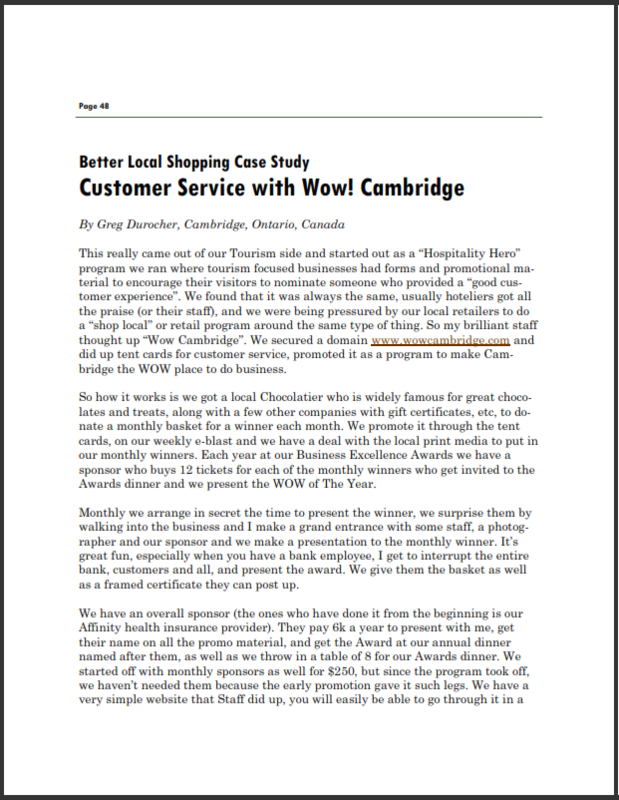 This downloadable ebook addresses the first question you may get hit with: do shop local campaigns work? I give you the research from a wide variety of sources. 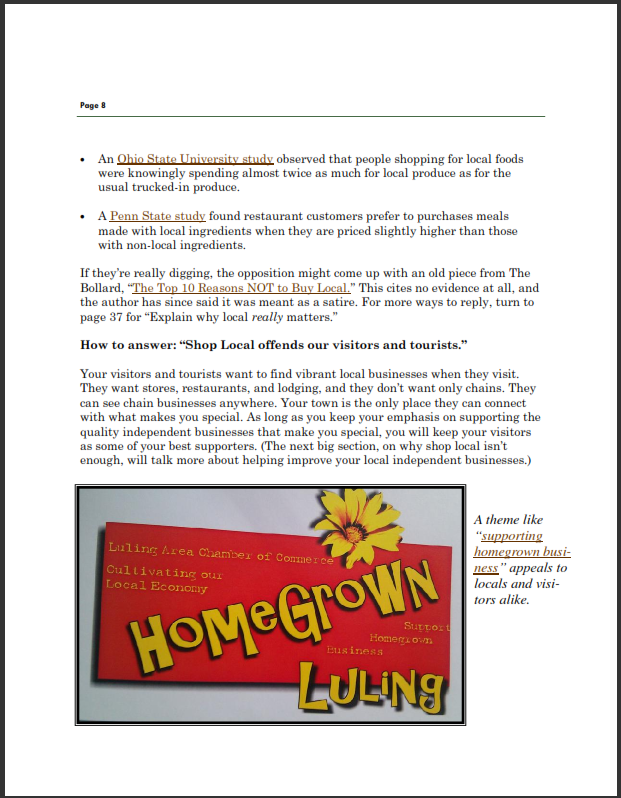 Because you have to work on those local businesses, an entire section is dedicated to Better Local Shopping and the 7 Most Common Weaknesses of Local Shops. This will help you organize some change. Then it’s finally time for the Shop Local campaign. The Shop Local Plan. Each step is focused on the actions that work the best for small town volunteer efforts. The seventh step shows you 4 ways to multiply the effect of your campaign and get more out of your efforts. There are also ideas for going it alone. Can’t get anyone on board with you? You can still start. That’s how you build momentum, and then you’ll start getting people on board with you. And of course some bonuses: a case study of a chamber of commerce that makes money while helping their businesses get better, a toilet paper story (?!) that’s helping one town focus their efforts, a smoking hot editorial you can reprint, and more examples you can learn from. 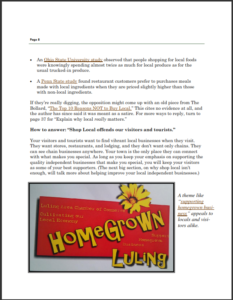 It doesn’t overlap with outstanding free resources like the “Building ‘Buy Local’ Campaigns” guidebook from AMIBA. It’s designed to work alongside these tools. In fact, I give you the link direct to all the best free resources specifically for small towns. Rather than tell you to spend a lot of effort creating your own promotional materials, I show you all the best stuff I’ve found that’s available for reuse. 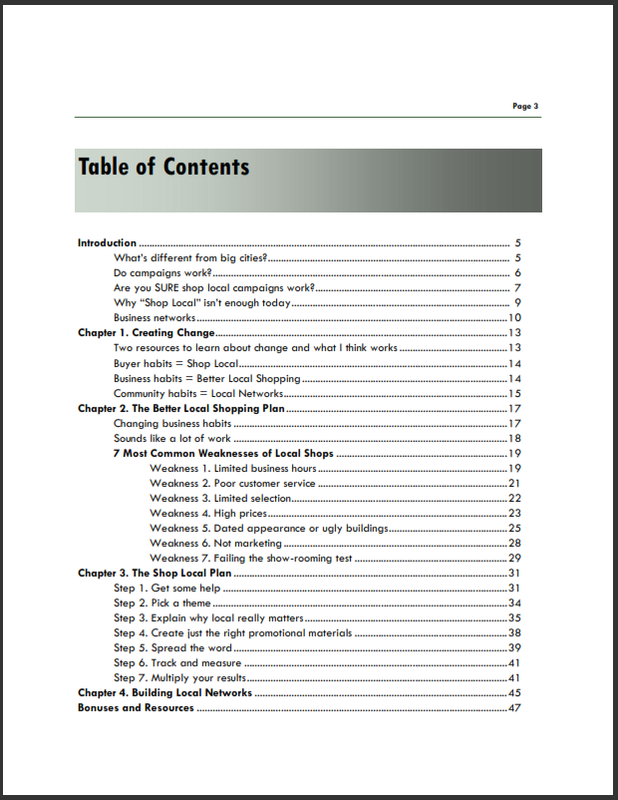 The original shop local ebook I published years ago was just 12 pages and cost $9. With all the new information in this 2.0 version, it’s over 50 pages now. 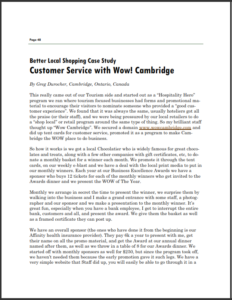 I’ve learned a lot about what makes shop local work, and I’ve built it in. I know it’s worth a lot more to you, but I still want it to be affordable enough that almost any chamber of commerce or small town business owner can manage it. At last someone who is tackling the ‘shop local’ problem in a better way. Simply campaigning to convince local customers to shop locally, just because the businesses are ‘local’, is doomed to fail. Instead of ‘pushing’ customers through the front door, with ‘shop local’, we need to ‘pull’ customers in with a fresh and dynamic approach from business owners. Once we have a group of businesses collaborating in this way, and offering potential customers ‘value’, then it is time to resurrect the ‘shop local’ campaign. This will work as there will be something to offer them other than the ‘warm fuzzy feeling’ of supporting local business. Holy &*$%, Becky….. I’m going to lock people in my office and make them read this. I want to pull excerpts out and use right now. I want to shake it under some noses and scream DO THIS!!!! McCray wisely starts by highlighting what’s distinctive about small town campaigns and addresses common weaknesses of their businesses. 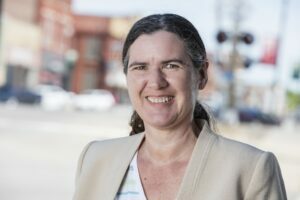 She recognizes a “buy local” initiative can make a positive impact only if businesses are providing the value and convenience residents demand, and proceeds to provide a concise overview of both common problems and solutions. She combines valuable insights for business owners (and is one herself) with the “big-picture” awareness of how a community can thrive through collaboration. 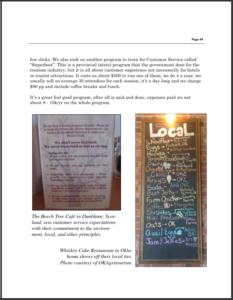 I recommend this to anyone seeking to strengthen their small town businesses and economy. This is a downloadable ebook in PDF. You’ll get access to save it to your computer immediately when you make your purchase. 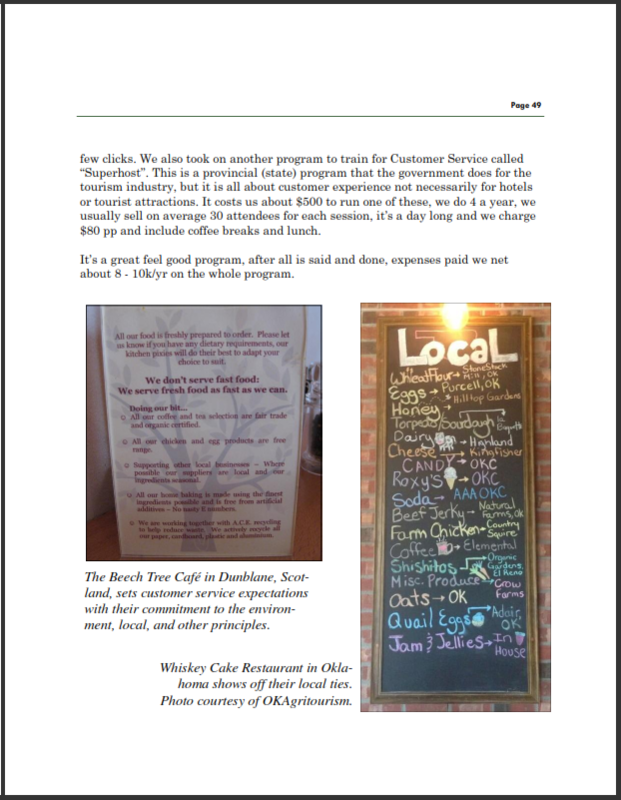 You can print out pages to work on if you want or need a paper copy. If you happen to lose the PDF you save, you can come back and login to download it again with no time limit.